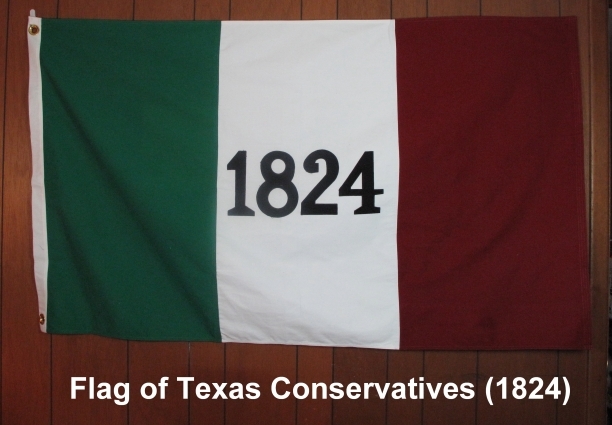 The flag in general use during the campaign against the Mexicans, especially by that faction of Texans who were known as the Conservatives, was the flag of 1824. This flag was favored by many Texans who wanted to show their desire to make peace with the Mexican officials. In fact, probably a majority of the Texans of that period looked upon it as Texas’s official flag in 1835 & 1836. The Conservatives were ever hopeful that affairs between the Anglo-Americans living in Texas and the Mexican government could be settled without war. Therefore, in order to not offend the Mexicans unnecessarily, they adopted the green, white, & red flag of Mexico, minus the eagle which was on the official Mexican flag. In place of the eagle, the Texans inserted the figures “1824” which announced to the world that they were for Mexico only if the Constitution of 1824 were observed. The Mexican Constitution of 1824 offered relief to the Anglo-Americans who were at that time being oppressed by the Mexican government of that period. Many believe this flag was among those in the Alamo when it fell. Ruth McArdle and Gentily, noted artists who have painted many pictures of Texas early days, display this flag in their painting. This flag was also credited with having been the official flag of Texans when they defeated General Cos at the Siege of San Antonio in December of 1835. It was also recorded as often being flown at the mast of several ships of the First Navy of Texas. 2'X3' cotton, cut & sewn. Satisfaction guaranteed. Fully refundable for 10 days upon receipt.